The Kilt Conclusion (ps it’s good news!) | Journey to "i do"
So last we left off, Mr. Sword and I couldn’t decide on whether or not we should rent a kilt or have one custom-made. Stressful times baby. But I’m happy to report that on our trip to Scotland, we were able to sit down, re-discuss the options and look into the process of making our own. And the conclusion is: Our family tartan has been designed AND ordered. YAY!! We started the kilt designing process with much encouragement from American family and friends, but I was surprised when the Mr. Sword’s friends were the ones who thought it was a little unnecessary and over-the-top. I guess it makes sense, their culture doesn’t buy into the crazy, big weddings that we do on this side of the pond and while they are all so excited to come to the wedding, they are just being practical and I totally understand that. But since making a family tartan was creeping its way up to the top of Mr. Sword’s priority list (thanks to lots of talking and both sets of parents contributing to the overall wedding budget), one night we sat down at the computer to check things out. We were lucky enough to find a website that not only let us pick our colors but also let us arrange each color at different widths. We decided to follow a pattern we liked so that our tartan had a good chance of looking somewhat normal. Our colors were taken from the wedding theme and I’m thrilled with the result. Once the kilt was designed, Mr. Sword went online to register it. We discovered that we can’t use Mr. Sword’s surname because your clan/family name would have to be registered by the the Court of the Lord Lyon in Edinburgh and that is usually reserved for historic family clans that already have tartans. It makes sense, we can’t just claim a tartan for every person with that last name, but we CAN make it specific to our branch of Mr. Sword’s last name. The woman at the Scottish Register of Tartans suggested we use both of our last names with a hyphen in between. So not only will my new last name be associated with the kilt but also my maiden name, pretty cool right? After the kilt and all of it’s pieces were ordered, we had to start the waiting game. You can’t rush authentically woven tartans after all! 1) It’s the Scottish’s first kilt!! He’s never worn one before and I’m happy to announce that he’ll be wearing his personalized kilt for the first time on our wedding day. 2) We now have a family tartan!! This is my way of embracing his country and it’s traditions (which isn’t always easy with us living in the US). 3) This is one more thing we can check off the wedding to-do list! Usually it’s the bride who orders her dress first because of the time it takes to get in and altered, but in our case, Mr. Sword got to join in the joys of formal-wear-ordering-fun. 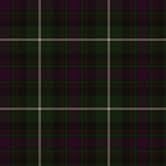 Unfortunately it’s a small picture and it’s nearly impossible to see all the different lines of color, but the majority of the tartan alternates between a dark purple and a forest green. I’m sooo curious to see how the colors look in person! What do you think of our tartan? Is anyone else ordering something really fancy for their groom? Pingback: Important People: Part One | Journey to "i do"
Pingback: The Glue gets Scottified | Journey to "i do"
Pingback: THE KILT HAS ARRIVED!! | Journey to "i do"
Pingback: Ceremony Deets for my Peeps | Journey to "i do"